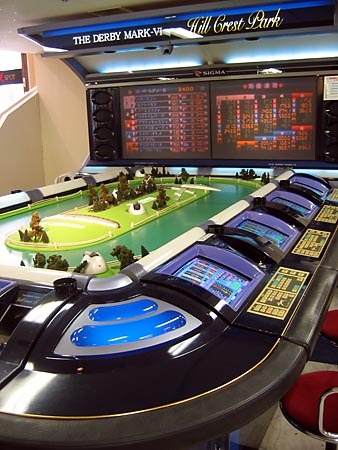 I first ran across Sigma Derby in various Las Vegas casinos (see rarely-updated Old Vegas for more information). 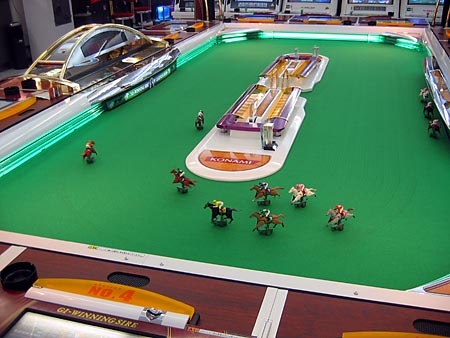 This is a more recent version of the Derby horse-racing game. 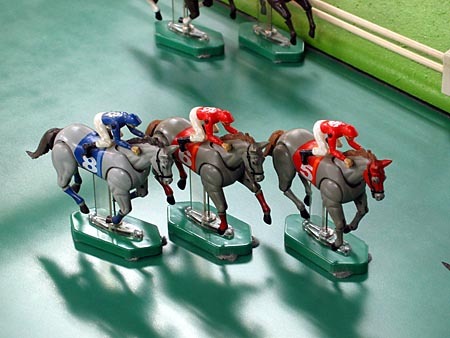 There are small video cameras peppered around the track which provide feeds of the small, articulated horses and their inert plastic jockeys. The legs move in a striking display of realism, if your cup of realism includes a tea bag of magnet-dragged horses and a lemon wedge of feet never touching the ground. The game actually "races" the horses even if no one's put in any money, convenient for arcade-obsessed foreign amateur photographers. It would be interesting to see what would happen if one of the horses was picked up off the track and placed somewhere else, but I didn't have time to create the definitive "Prisons In Japan" webpage. "So ... what are you in for?" "Yeah, same here. Kinda irrestible, ain't it." 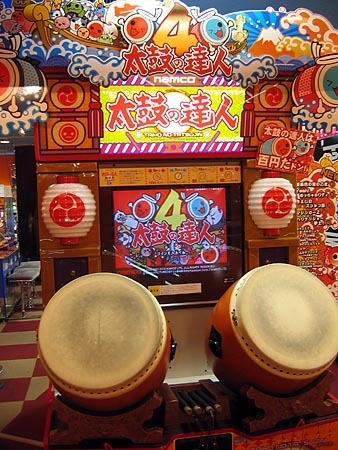 Taiko no Tatsujin is a videogame that asks you to beat on large fat drums in time to music. The images on-screen tell you when to pound the left side, the right side, both sides, pound furiously, tap the edge, pour milk on the surface and create an '80s music video, etc. The first one of these I ran across was out on the street in Akihabara and I didn't feel like being a gaijin exhibitionist that day, so I passed. The next one was on the sixth floor of a pretty empty department store, so I was rarin' to go. Unfortunately in my excitement I chose the "super-beginner" session and thus "beat" the machine handily. But I was not challenged. 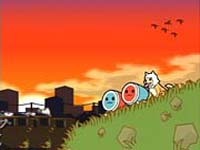 I WILL BE BACK TO CHALLENGE YOU AGAIN FAT DRUM VIDEOGAME. Happy drums throw confetti in the air, celebrating their cuteness. This one's out-of-focus, all part of the free service I provide for my seven loyal customers. Here, we discover that the key to making the drum blow large bubbles is to beat on it furiously. I salute this recent "return to reality" videogame trend. 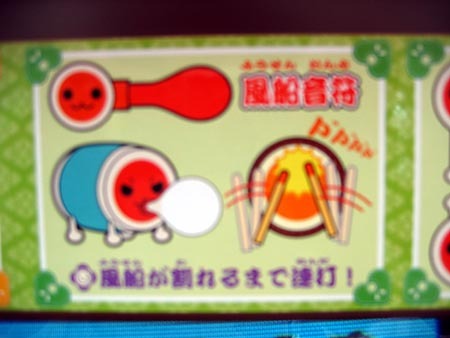 It is always disturbing when a cute Japanese cartoon drum winks at me while white-water rafting. Background: Fancy Lifter. 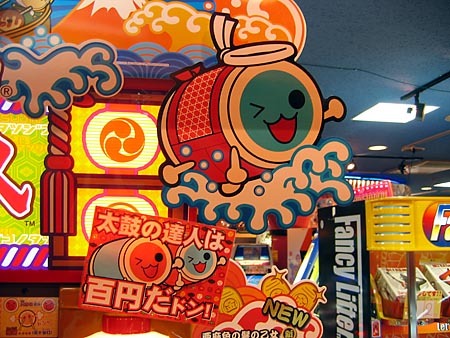 A crane game in which you're expected to lift small finger cakes with a mechanical hook, along with the doilies. Japan never fails to surprise. 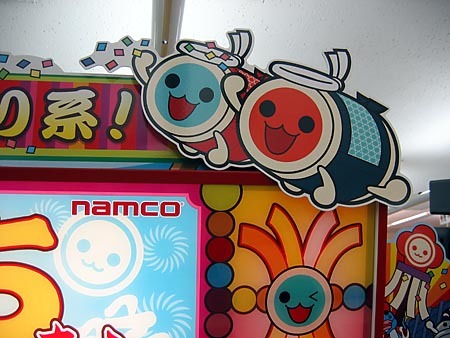 Namco has just introduced what appears to be a six-player version of Taiko no Tatsujin. Man, I don't even know six people. Who would play this game. In Japan. 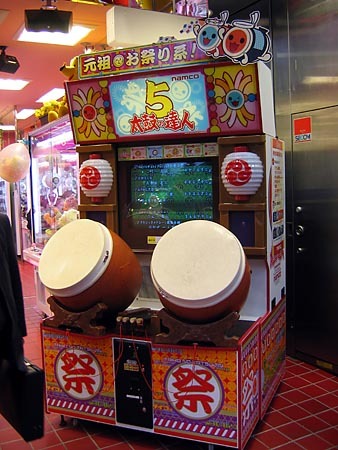 Taiko no Tatsujin is also available for the PlayStation2. Here is an image from that game. "Your vision disturbs me, Sanchiko. A future in which no humans exist? Who then, will beat on us?" "We shall beat on each other." "Fluffy and his kind will join our glorious far-sighted rebellion of drums and make wonderful cannon fodder."